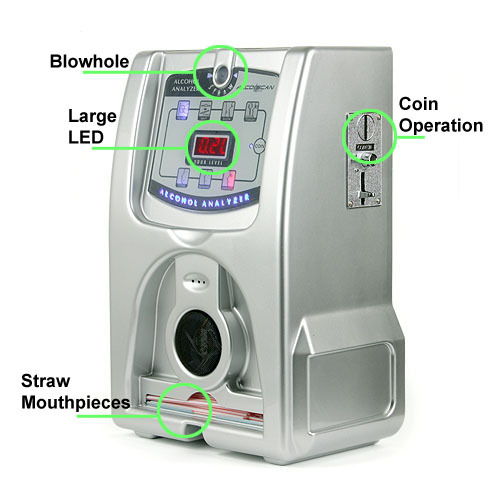 The AlcoScan AL3500 Coin-Operated Breathalyzer is a Breath alcohol tester for use in public spaces with 3 digit LED display of BAC, micro-computer control, automatic test sequence with visual and audio cues, activation by coin or free play button, universal power supply for AC 90 - 230 V operation. The AlcoScan AL3500 Coin-Operated Breathalyzer is perfect for any bar, restaurant, club or any other establishment where alcohol is served. It offers customers an opportunity to know their exact BAC and offers owners an opportunity to add profitability to their business. The AlcoScan AL3500 Coin-Operated Breathalyzer is easy to use, easy to maintain and sure to be a hit with your patrons! Ensure sanitary testing of many subjects with the AlcoScan AL3500's disposable straw mouthpiece system. Increased blowing time allows for deeper lung samples, ensuring more accurate readings. Why would a bar owner want a machine? It projects the owner as a "responsible corporate citizen" in the community. It provides a tool and a tactful way to cut-off drunk and unruly customers. In this age people are more aware of their blood pressure, cholesterol levels and now they want to be "Alcohol Aware" too. What do I need to do to service my machines? The machines should be checked on a weekly basis for the first 3 weeks. After that you can service them every 3 to 4 weeks. Service is minimal. All you need to do is: collect your money, replace your straws, and clean the outside of the machine with mild soap and water. Then check the machine's calibration about every 6 months. What types of people use our machines? Everyone, young and old. With the growing Worldwide concern over drunk driving more and more people are wanting to be "alcohol aware." Most of the repeat users will be young people at college bars and sports bars. Many businessmen are also using these machines again and again. The drunk driving issues insure repeat use of our machine for years of constant income. The test must be in a controlled environment, no alcohol or smoke present. The test must be administered by a certified State/Provinical technician. The test results must be in a printed form for admission into court. The test must be on a State/Provincial approved and certified machine. There is a legal disclaimer printed on the front of each machine. Sports bars, Military clubs, Discos, large Nightclubs, College bars, Restaurants, Race tracks, Sporting events, or just about anyplace that a large amount of alcohol is served. There are several key factors in deciding how much to charge for each test. In the U.S., most college area bars will have no problem paying 1 US dollar per test, or 1 Dollar Canadian. What type of straws are required? Our machines use normal straws! Straws can be ordered in every country from restaurant or bar supply companies.